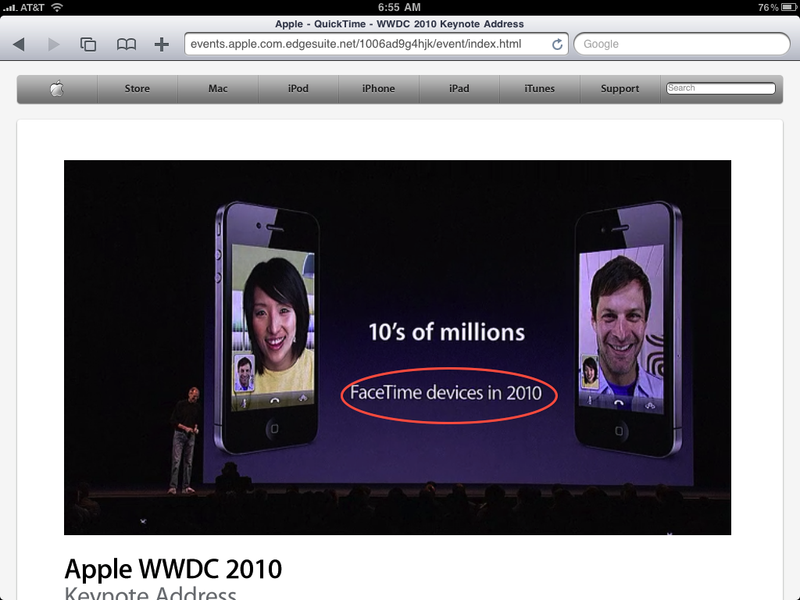 Most of us watched the Apple keynote or at least the video about the new iphone 4 with face time. Amazing how apple wants us to believe that this is something totally new. Skype exists since a while and has over 560 Million users. But of course most of them only on computers. However there was a while a Skype wifi phone on the market. Since a few weeks we can use Skype with iphone but no camera. Since Germany started to sell phone for UMTS (fast Internet) there has been phones with two cameras on the market (as example Sony Ericsson C905 since 2008) which could do video calling. Long before, before Apple or skype I used from T-Mobile video calling over landline, which was in the year 1999. I won two of them at the CeBit (a computer fair) and had one in my condo and one at my girlfriend condo. Worked great over ISDN. But Apple let us believe they are the first with video calling inspired by Star Trek. However I think face time is great and it was time to offer it. I think Apple did a great job and it works very fine. It will be a new standard and many will follow. The most interesting thing was that in the keynote, the slide did not say 10’s of Million iphone shipped this year with face time. It said devices (see screenshot). I believe this is an indicator of an upcoming ipod touch with two cameras (hence wifi), an ipad with front facing camera, and an OSX update with included face time for computers, replacing ichat. This could be an indication that Skype will have in 12 months a big competitor for video calling and international calls (over wifi). Apple has already 100 Million mobile devices sold (Ipad, iphone, ipod touch). If all of them will get face time and camera and all their computers right now on the market, then we will see face time on almost 150 million (if we count all Mac OSX computers sold). Plus Apple says there face time will be open standard. That might be we see either face time on other smart phones or at least similar applications which can communicate to face time. We all love Skype (besides the spam messages), but it could be that skype is soon not anymore number 1.